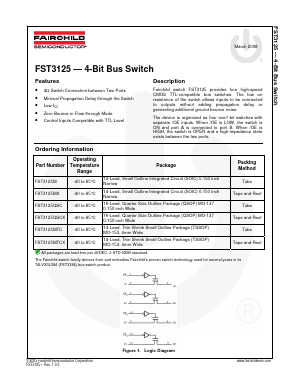 Fairchild switch FST3125 provides four high-speed CMOS TTL-compatible bus switches. The low on resistance of the switch allows inputs to be connected to outputs without adding propagation delay or generating additional ground bounce noise. The device is organized as four one1-bit switches with separate /OE inputs. When /OE is LOW, the switch is ON and port A is connected to port B. When /OE is HIGH, the switch is OPEN and a high-impedance state exists between the two ports.